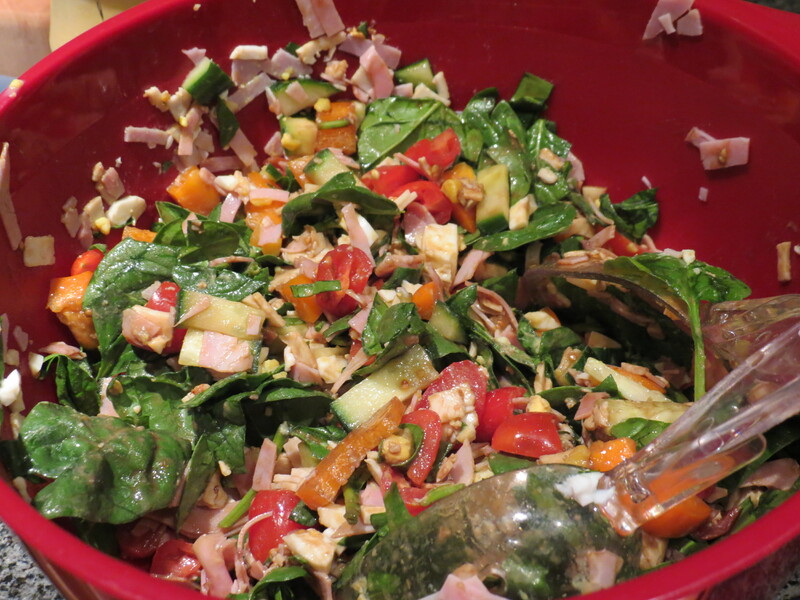 This salad takes about 15 minutes start to finish and the majority of that is waiting for the egg to cook properly. Perfect hard-boiled eggs are an art, but an easy art. Thanks to Ina Garten for this fool-proof method. 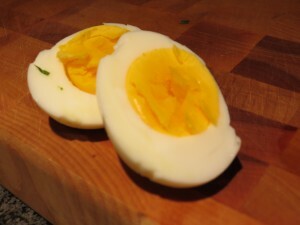 Place eggs in a pot and fill just until covered with cold water. 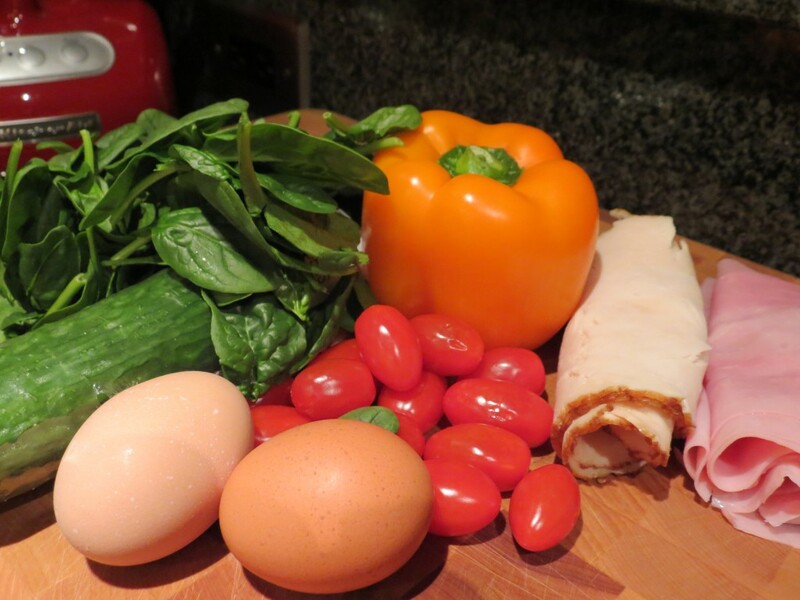 You can cook as many eggs as will fit in one layer, so feel free to make extras for snacks throughout the week. Cover and place on the stove over high heat. Bring to a boil. As soon as the water comes to a boil turn it off immediately, set a timer for 10 minutes and walk away! Seriously. Don’t lift the cover until that timer goes off. Don’t let it boil for an extra 30 seconds just to be sure. TRUST ME. The heat gets trapped inside and will cook your egg to perfection with no green rings or any other signs of a poorly boiled egg. After your timer goes off, drain off the hot water and run the eggs under cold water. Set aside until ready to use and store the extras in the fridge. In order to keep yourself from watching the eggs and wondering if they’re really cooking in there once the heat is turned off, use this waiting time to prepare the rest of the salad. My trick is to chop everything to approximately the same size. I love chopping salads because it makes it so much more likely that each bite will be a delicious blend of all the ingredients rather than a mouthful of spinach or cucumber only. I have gone as far as purchasing a handheld salad chopper. You can of course, also use a knife for this task. If you’re using a knife, work on each ingredient individually and then add them all into a large bowl. You should also use this time to make your salad dressing. I grew up watching my mother do this, but it seems to impress most people. I’ll let you in on a secret… it’s the easiest thing to make and there are so many upsides to making your own dressing. 1. You get to control the amount of oil 2. You get to put in the flavors you love rather than committing to 1 or 2 bottles at a time (did I mention it’s impressive and easy). 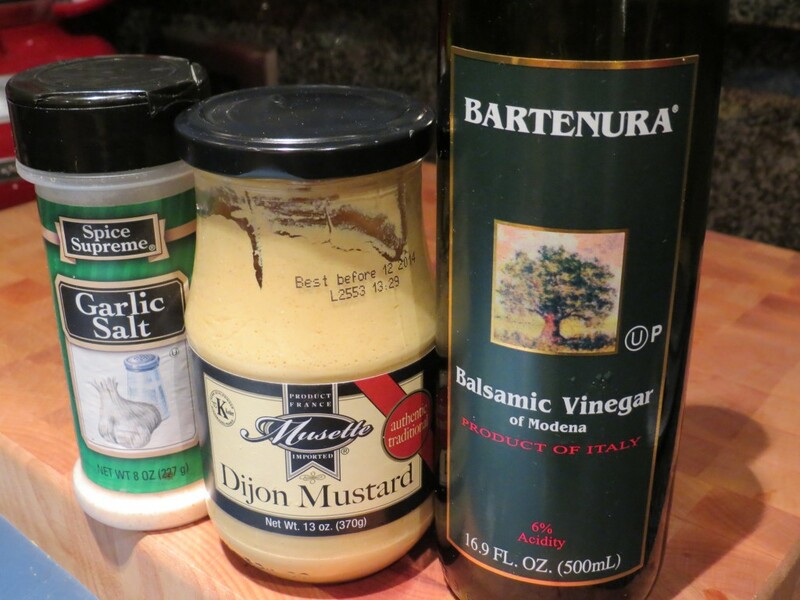 The base of all of my dressings start in the same way: 1 tsp of dijon mustard + acid. Acid could be lemon juice, lime juice, I’ve even juiced clementines! Or of course, a vinegar (flavored or otherwise). If you need olive oil or if the acid is too intense, you can use oil of course. I typically don’t unless I am feeding a crowd. Today I used balsamic vinegar. 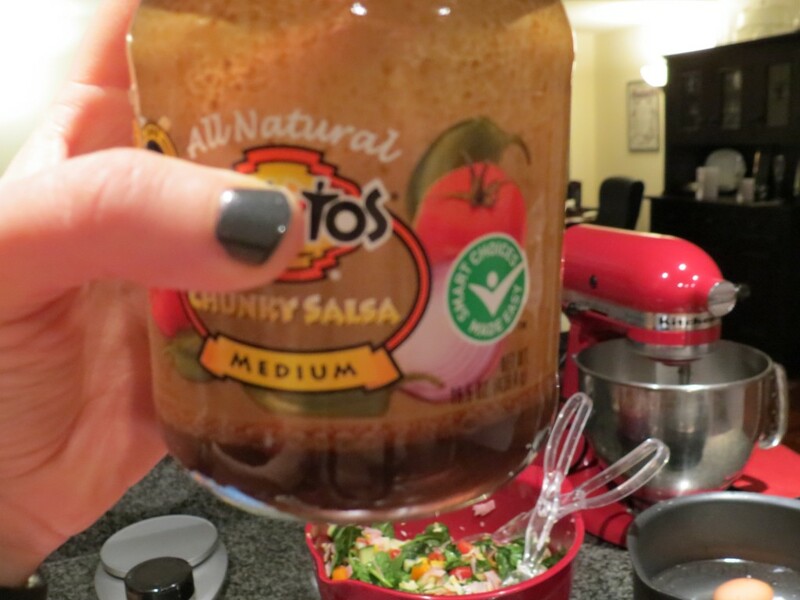 Combine mustard, vinegar, and garlic salt in a jar (I always save old salsa jars). Seal and shake. The mustard will make your dressing delicious and thick even without any oil. Taste and adjust as needed. At this point, all you need to do is peel and chop your eggs (and be really proud of how beautiful they came out), add them to the bowl along with the dressing, stir, and serve! 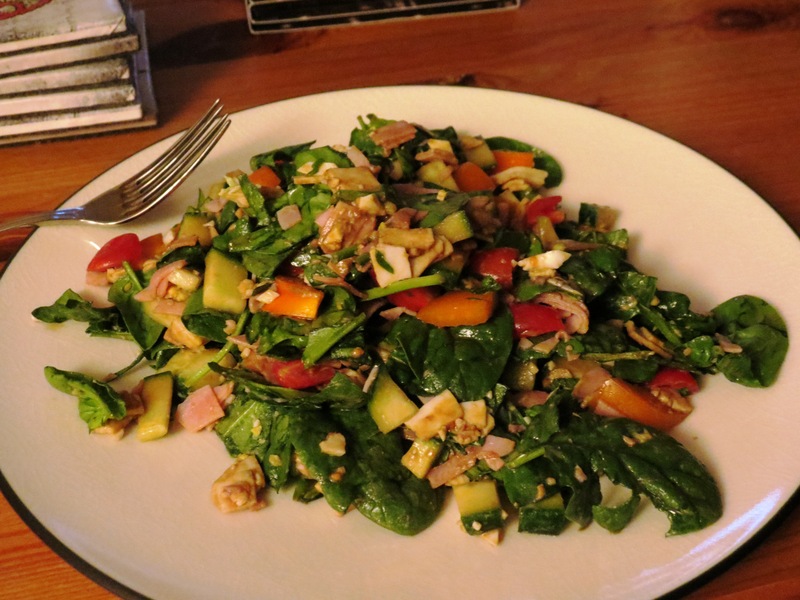 This makes an enormous amount of salad and each serving is only 250 calories. 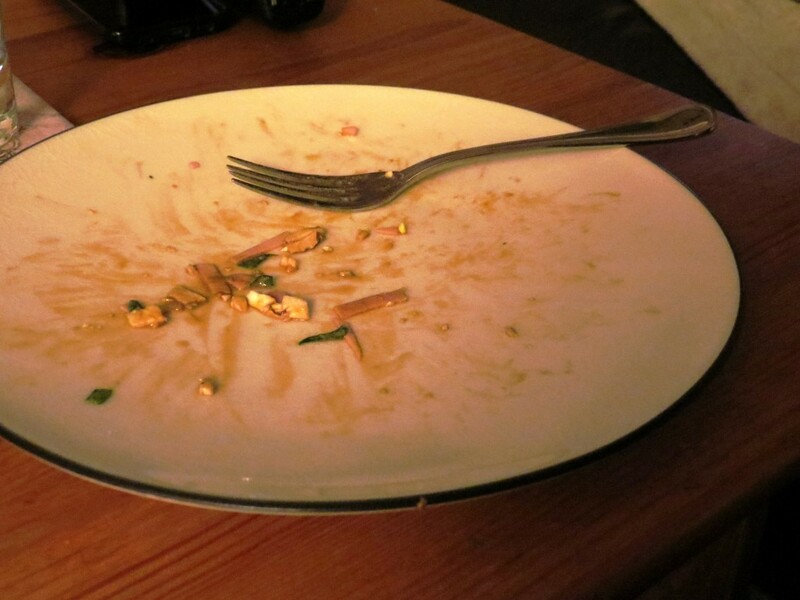 This entry was posted in Anytime, Better Bites, Dinner by michcorbett. Bookmark the permalink.